Pushin’ For A Purpose is a 501 (c)(3) organization that is operated by skateboarders who are dedicated to giving every child the gift of skateboarding. They supply all children interested in joining the skateboarding community, with new/used skateboards as well as basic instruction. This December, we have partnered up with our neighbors, Ketchup City Creative of Sharpsburg, and Panza Gallery of Millvale to bridge the 3 communities on the same weekend and what better way to do it than with art and music! Each gallery has selected a charity to raise money for during the weekend of November 30, December 1 & 2, 2018. Charities include North Hills Community Outreach, Backpack for Hunger-Fox Chapel, and of course, our buddies, Pushin’ For A Purpose! Why not have a hip hop show in a small space?? 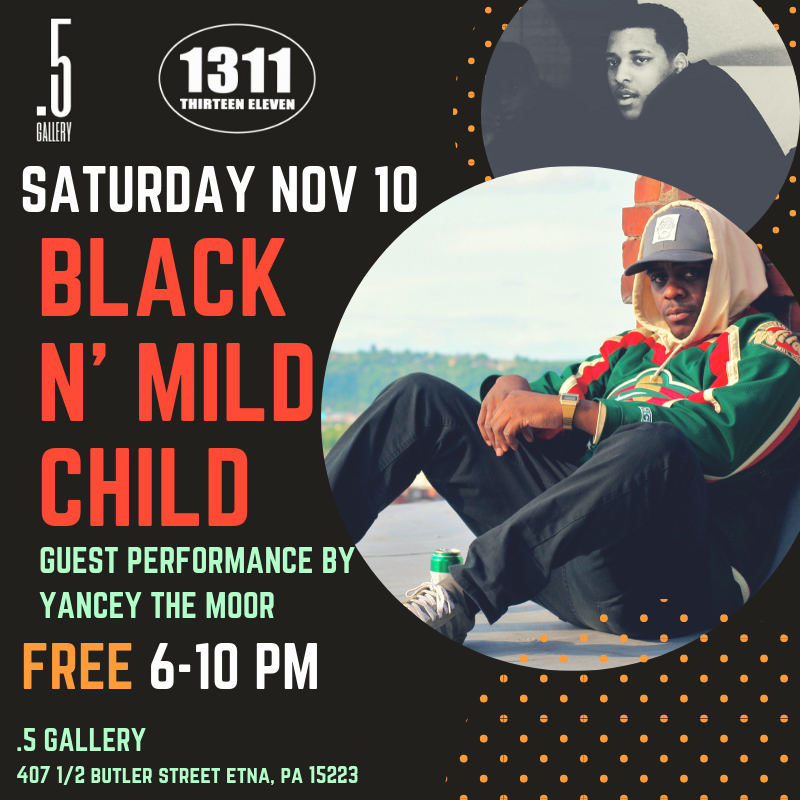 Join us for a night of good flows coming from local MCs, Black N’ Mild Child & Yancey The Moor. These guys will be performing in Brian Gonnella’s newest installation, That Episode of Futurama Where The Professor Creates The Universe In A Box! Check out some sick artwork and listen to awesome jams while you sip on some spiked Turner’s Tea provided by Bar 1311! a name that speaks for itself. A local artist respectfully keeping old-school hip hop alive. Influenced by artists like Nas, MF Doom, A Tribe Called Quest, OutKast and Wu-Tang Clan, he was fascinated by intricate word play and delivery at a young age. He started recording in 2011 from his freshman dorm room which quickly grew to a few performances at The Rex Theater. Three years later, now in Annapolis, he formed the group DVLSA with a producer from Texas and rappers from Maryland. With DVLSA he was able to mold his craft and develop a more confident style and flow. Eventually settling back home in Pittsburgh in 2018 ready to bring conviction along with his music! is a 22 year old mc from Pittsburgh, Pennsylvania. He's been writing poetry since his sophomore year in high school and seriously recording music since his senior year. Now he has plans on being heard not only locally but globally. He brings a 90's style lo-fi melodic hip hop vibe outside of the social norm. His influences include 2pac, Biggie, Ice Cube, Nas, Jay-z, Wu-tang and Mobb Deep. .5 Gallery's first site specific installation!! 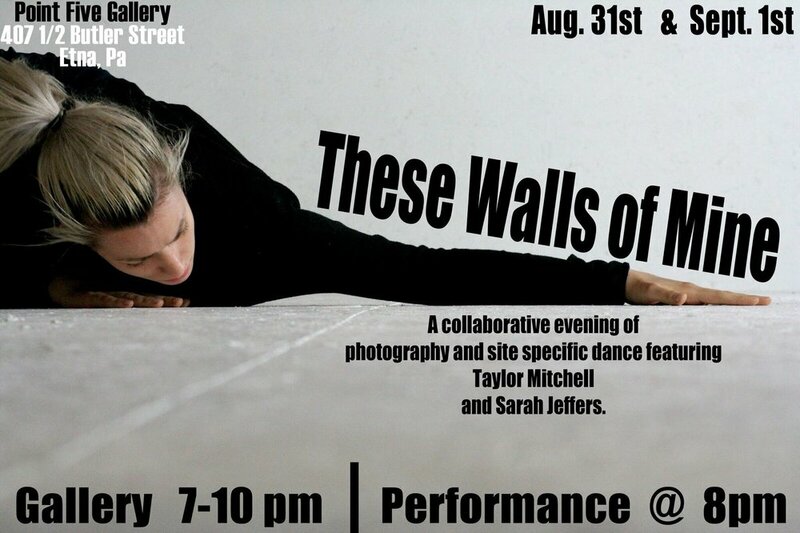 Sarah is a creator and performer with a focus on site-specific, modern dance. She utilizes performance to challenge audiences while considering their guest experience. By exposing her personal vulnerability and internal landscapes, she provides permission for audiences to approach their own. Through collaboration with other mediums she is able to curate safe spaces that elevate this experience and the work of the artists involved. Her intent is to build more social space for the radically soft parts of us. This Saturday night we will be checking out live painting from Max Gems Gonzales and groovin' to the tunes of DJ's Second Coat, Drish, & Dicey! Join us for an afternoon of live art and live music with strong community vibes! Join us for an evening filled with soulful tunes, great vibes, and playful artwork. The hats will be off as we adorn the .5 Gallery with pieces from Ryan's private hat collection!